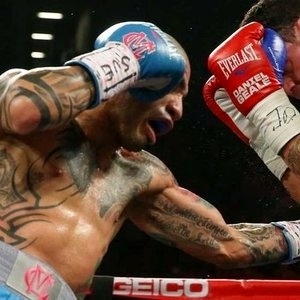 Miguel Cotto – Boxer: The stocky 5’7 1/2″ Boxer/Puncher is a brutal body puncher with textbook technique. Cotto is a natural welterweight that will be at a size disadvantage against Canelo. Miguel is well-rounded with excellent power, combinations, stamina, defense and agility. Miguel Cotto is a purple-hearted veteran with a solid chin and steely resolve. A natural lefty, Cotto has a heavy left hand and can even fight southpaw. On the downside, Miguel is short, 34-years old, susceptible to cuts and can be outboxed by speedsters. Get ESPN2 News Vegas Sports Picks delivered to your E-Mail!